So I used a vector made by 'metalmallow then added around 2 layers of parchment like texture for the background with another brownish color overlay. As soon as I saw the hollow vector I just knew it had to be parchment texture xD I actually struggled a bit with the background since I wanted to keep it simple but not too empty so I added some text behind Light's name, it's actually the instructions in the Death Note. I then added the blood and to blend it in, I put the layer under the textures' layers. And that's pretty much it. Simple but interesting. I like it :D It would be good if blood was darker and a bit more blended in. Background looks like some kind of really old paper so blood would be good looking old as well and totally soaked in and dry. 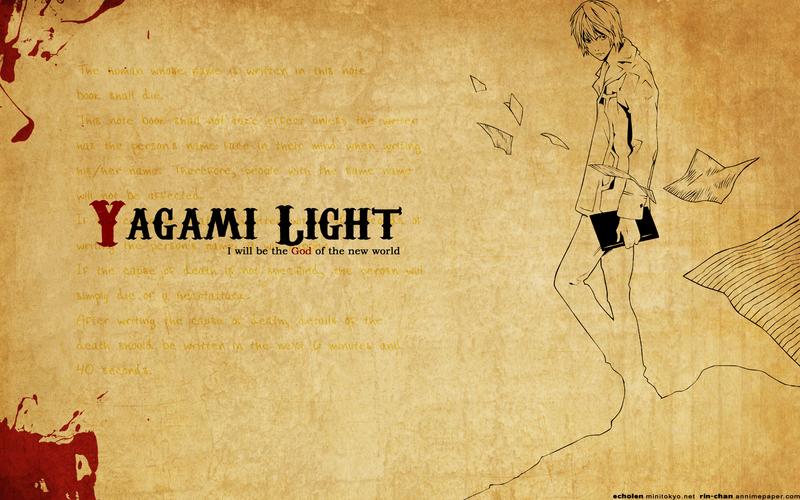 i love deathn note, thanks for the wallpaper. Sugoi, i like this wall !